When King Solomon built the Temple in Jerusalem he said, "I have built the temple for the Name of the LORD, the God of Israel. I have provided [or fixed] a place there for the ark, in which is the covenant of the LORD that he made with our fathers when he brought them out of Egypt" (1 Kings 8.20,21). At that time, "The priests then brought the ark of the LORD's covenant to its place [or standing spot] in the inner sanctuary of the temple, the Most Holy Place, and put it beneath the wings of the cherubim" (1 Kings 8.6). After the Ark was taken away a stone remained there from the time of the early Prophets [i.e., the time of David and Solomon], and it was called Shetiyah (foundation). It was higher than the ground [i.e., than the floor of the Holy of Holies] by three fingerbreadths. On this [the High Priest] used to put [the fire pan of burning incense]. This reference to a stone sticking up from the floor of the Holy of Holies answers a question I've had in my mind since I visited the Dome of the Rock on the Temple Mount of Jerusalem in February of 1978. When I entered the Dome of the Rock, the first thing that arrested my attention was the fact that the great chunk of bedrock, over which the gorgeous mosque is built, protrudes to about 6 feet above the floor. If it were not for the mosque building, the massive rock itself would present a dramatic interruption to the flat plane of the Temple Mount platform. However, this Temple Mount platform of today is where the Temple and its courtyards used to be, so the thing that puzzled me was that I had never heard or read of any big rock jutting up from the floor of the Temple courtyards in biblical times. I reasoned that this outcropping of bedrock had to have been covered by the Temple building, and probably by the highest part of the Temple, the Holy of Holies. The above passage in the Mishnah confirmed my thinking. The rock outcropping in the Dome of the Rock is the top of the Temple Mountain over which Solomon built his Temple, Ha Shetiyah, the Foundation! 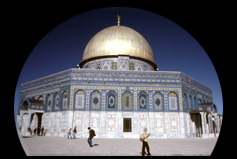 In the 1990's, Dutch archaeological architect, Leen Ritmeyer, did an extensive study of the exposed part of the rock, housed by the Dome of the Rock. This exposed outcropping is called es-Sakhra in Arabic. On the massive top of es-Sakhra, Ritmeyer found two flat rectangular areas that he recognized as foundation trenches, cut to create a level surface on which foundation stones for a building could be placed. This means that a building once had part of its wall standing on top of the currently visible surface of es-Sakhra. When Ritmeyer measured these foundation trenches he found that they were made for a wall that would have been a little over 10 feet thick. Guess what ancient building had walls of that thickness — Yes, the Holy of Holies! The Mishnah again, in Middoth 4.7, says that "The thickness of the wall of the ... Sanctuary [was] six [cubits]." Six cubits is 10 feet, four inches. Once Ritmeyer found this probable placement of the south wall of the Holy of Holies, he found that the west and north sides of es-Sakhra have escarpments, i.e., natural or man-made cuts, where walls could have been placed to form a room exactly 20 cubits square, the dimensions of the Holy of Holies as given in 1 Kings 6.20. Now, here's the interesting part. Once Ritmeyer had overlaid a photo of es-Sakhra with an outline of the walls of the Holy of Holies, he noticed a perfectly rectangular depression carved in the rock in the exact center of the 20 cubit by 20 cubit space. When he measured that rectangular niche, he found it to be 4 feet 4 inches by 2 feet 7 inches, or exactly 1.5 by 2.5 cubits, the dimensions of the Ark (Exodus 25.10). It appears that the "standing spot" that Solomon prepared for the Ark, was a flat depression at the very peak of the Temple Mount where the Ark would rest in complete stability. It is in this flat depression where the Ark with its blood-sprinkled Mercy Seat once stood, and where later the High Priest placed the fire pan of smoking incense. And this spot is still visible! See the diagram. What does all this mean? Well, for those of us who believe that the Jewish Temple must be rebuilt before Christ's coming (based on predictions in Matthew 24), it means that somehow the Muslim Dome of the Rock is going to be [re]moved. The Jews will not stand for their Temple being built anywhere but where the special presence of God once resided in it. The rediscovery of Ha Shetiyah, the Foundation, reminds us once again that God provided a way for us to be justified in His sight. The Ark sat on Ha Shetiyah, and in the Ark sat the tablets of the Law. When God looked down from Heaven upon this spot, He saw the Ark and He saw His Law, but over it all He saw the blood sprinkled upon the Ark by the High Priest. That blood testified to the atonement sacrifices made for the people who had broken the law by their sins. That blood also testified to the ultimate sacrifice made very nearby, the sacrifice of Jesus for a law-breaking world. It's because of that blood that you and I can plant our feet by faith on the Living Foundation Stone that will never be moved! Praise the Lord.